What is actually a heat pump? The heat pump is a machine or device that utilizes the energy of the environment. It is operating on refrigerator principle but it uses the amount of heat output in the condenser instead of that dissipated by the evaporator (Encyclopedia of environmental and natural protection, 2002). It can be used for heating in winter, for cooling and air-conditioning in summer, and is suitable for domestic hot water preparation. It will not directly transform the energy used for operation into heat but increases the lower temperature to a higher degree by external energy. Its heat-source can be either outdoor air or the water of a river or lake, the heat content of the water of wells or the soil, or the industrial waste heat. The heat pump uses mechanical work, while effectively „moving” heat from a location of lower temperature (i.e. outdoor air) by way of mechanical work to another location of higher temperature (such as a room). In the summer, when cooling is necessary, the process should simply be reverse so that the heat pump extracts heat from the warmer room air and transfers it outdoor. Its matter of principle is the second thesis of thermodynamics that states: „no circuit is possible that results that „There is no cyclic process with the sole result of transferring the heat received from a heat sink to equal work”. It means that the colder body cannot transfer the heat to a warmer body, the heat can only move itself from a warmer place to a colder one: the differences in temperature can be equalized this way (Holics, 1998). 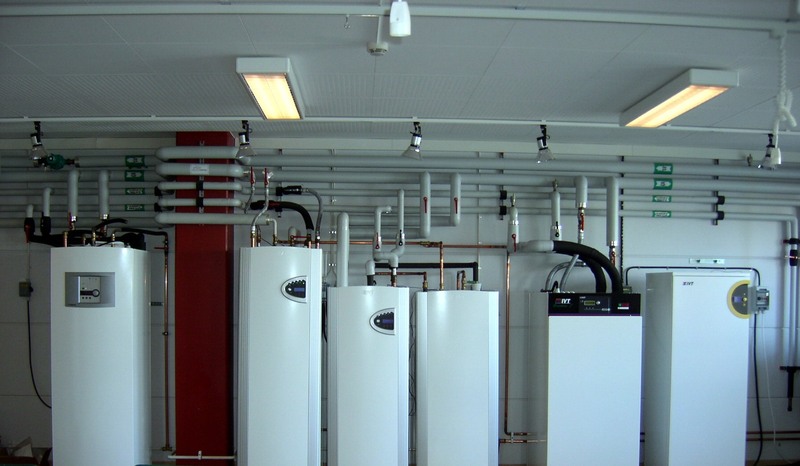 The heat pump operates the reverse way: with mechanical work investment it produces heat and establishes a temperature difference for heat production where the lower temperature will be determined by the environment and the higher temperature will be determined by the recoverable heat (Komlós et. al, 2007). Carnot’s thermodynamic cycle should also be mentioned since the theoretical operation of the heat pumps is explained there. As to Holics (1998) „the efficiency of the reversible Carnot-cycle is independent of the material quality of the refrigerant and the machine structure but is only depending on the temperature of the cooling reservoir T1 and heating reservoir T2”. Under ideal conditions, its efficiency (COP) is the highest from among the reversible cycles between the minimum and maximum temperatures. It means, this cycle dissipates the less energy for reaching the same temperature. For heat transport it is necessary to supply energy continuously in the system: it means the work. Its efficiency can be characterized by the so called COP=Coefficient of performance that shows how many times the useful heat output supplied by the heat pump is larger than the working output consumed for the operation. This ratio can be changed during the year by the changes in the temperature of the heat source, therefore the SPF = Seasonal Performance Factor can give more exact data of the heat pump output. It mainly depends on how much is the temperature difference that should be surmounted (difference between the heat source and the heating outgoing temperature), that is generally between 3.0-5.0, in other words, one unit of electrical energy provides three to five units of thermal energy (compared to the electric heating where one unit of electrical energy provides one unit of thermal energy). The COP is generally in practice a value of between 4 to 5, so that one unit of electrical energy can produce four to five unit of thermal energy (Tóth, 2008). It means the 45-65% of the theoretical value, but due to the developments of the technology, especially those of the compressor, this value is improving constantly (recently the screw and scroll compressor is a new development that could increase the efficiency by 20-30 % compared to the air compressor).